Master Class - Classes are coming up! Master Classes are designed for professional actors or advanced emerging professionals who have a strong desire to grow in the understanding of their own work. The classes involve challenging the actor to develop the inner resources that will lead to the richest possible performance. This methodological approach is physical in structure and leads to releasing the resistances that stand in the way of physical, mental, intuitive and emotional transformation. 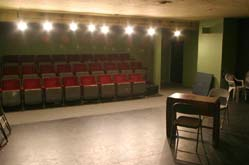 The technique includes exercises and improvisation that brings the internal and external truths of the character to the stage and examines the tension between them both. To challenge and excite participants about how the inner life affects the quality of their work. To examine the physical qualities of SENSING, THOUGHT, TIME and EMOTION in their relation to movement. It is essential to develop the reservoirs and inner resources of the individual actor in order to create a fuller, richer and more complex character. As well as living truthfully within the imaginary circumstances it is also essential to develop a familiarity and understanding of those centres within ourselves we don’t normally use in ordinary life, and to do so without judgment. We need to wake up all our inner resources, to experience the world in ways we never knew possible. Mr. Bentley-Fisher’s approach to the work makes the assumption that everything is movement, and that much of the actors’ development is finding the means to untie the knots that impede that movement. Thought is movement – emotion – our intuitions and sensuality is movement. The energy between our self and our partner is movement, between the impulse and the action, our inner and outer lives. Voice, gesture, making a decision – all is movement. The true actor develops the openness and tools that allow the purity and accidents of movement to be revealed through the most honest means possible. Mr. Bentley-Fisher introduces the actor to a series of exercises and improvisation that take the actor through the inner and outer movements that will help in the process of transformation when building the character. The assumption here is that our inner and outer realities and different, and it is the relationship and movement between these two different realities that create the most riveting performances. • Inner life and outer life. The difference and interplay between them both. • The movement qualities of weight, space, time and flow, both contending and yielding. • Acting as an active/doing process. Solving the problem. Playing the objective. Going through the process rather than indicating the process. Discovering the Shadow Move; living within the accident. Session One: Introduction to physical energies of Weight, Space, Time and Flow, and to their transmission and reception elements. Session Two: Introduction to working actions based on the reception and transmission elements of physical centres. Session Three: Relating music to the character centers. Introduction to the Six Inner Attitudes, based on the prominence of developed character resources. Session Four: Improvisations exploring the students’ prominent characteristics in relationship to the six inner attitudes. Session Five: Improvisations exploring characteristics not prominent to each individual student, and the relationship between the inner and outer experience of the character. The above sessions all require a great deal of improvisation and movement. The attempt is to introduce the students to the ideas through sensation of action rather than speech. Maximum enrollment: 12 Students four hours per day.